Who was Nellie Payne? • Who was Nellie Payne? Home » Who was Nellie Payne? Note permission was sought and given by DPAC (Tas Gov) to use this article. Ellen Field, known to her family as Nellie, was born and raised at ‘Westfield’, Westbury. She married Dr Charles Alexander Payne in 1887. When the couple moved to Victoria, Ellen took woodcarving lessons that changed her life. She subsequently became one of Australia’s most prolific female sculptors of the twentieth century. The Paynes moved to England in 1899. Ellen enrolled at the Art Department of Goldsmiths College at the University of London when Dr Payne was appointed the Principal Physician to the Duke of Teck. While there, Ellen undertook one of her first carving projects for Tasmania – a memorial pulpit to her parents for St Andrews Church in Westbury, where there is the greatest single collection of her work. By 1908 the Paynes had returned to Tasmania. Commissions followed for the Hutchins School in Hobart, St Andrews Church in Westbury, the Launceston Church Grammar School and many others. During World War One, Ellen created works to fundraise for the Red Cross, conducted private classes in woodcarving and volunteered as an instructor in handicrafts for disabled returned soldiers. 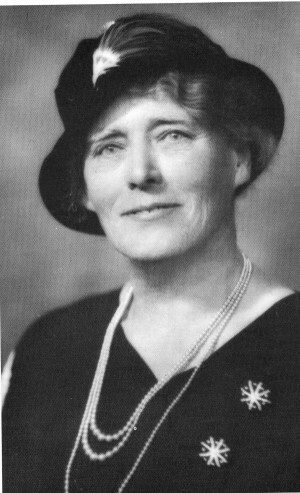 After the war, Ellen created Honour Boards for the University of Tasmania, local businesses, churches and town halls around the State, and some 34 ‘dower chests’ for family and friends. A patient and gifted artist, her other talents included needlework, leather work and sheet copper embossing. In 1924, Premier Joseph Lyons presented Ellen with a special medal for a decorative screen she created featuring Australian flora and fauna, which was displayed in the British Empire Exhibition. She later carved the Royal Coat of Arms for the House of Assembly in Parliament House, Hobart. One of her last major commissions was a vestry plaque for All Hallows by the Tower Church in London, which she completed when she was in her 90s.